5 YEARS STRONG AND ALL BECAUSE OF YOU! 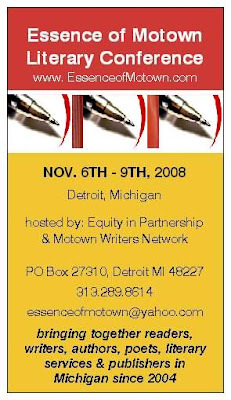 In cooperation with Motown Writers Network and Equity in Partnership (501c3), The Essence of Motown Literary Conference Jam will be celebrating from 5th year in exsistence. Celebrate with us for many more to come and join the largest literary conference in Detroit for 2008. With past attendence of 300+, we hope that we can triple that with your presence. Network with readers, authors, poets, publishers, agents and writers, sell and buy books, bring a bookclub, join a writer's group and learn about writing, publishing, marketing & promotion in 4 days of literary fun. There will also be a special youth component added this year, we're in talks to have an agent at the conference this year, two national bestselling authors that have much awaited novels coming out around the same time as the conference and a lot of the events that the participants of the past have come to enjoy about the conference. In 2008, we expect an attendance of over 500+ and a conference booklet distribution of over 1000+. Not only that, during the conference promotion, we receive hits of over 20,000+ from all the marketing and promotion that we do on the Internet. The larger your sponsorship and the sooner you participate, the more visual your product and service is for the community. We look forward to your support and helping the literary community of Michigan.